Get all hands on deck! Home water damage needs your immediate attention. The damage clean up may be complicated, and your insurance coverage may be complicated. Hidden water can get under your floors, behind your walls, and above your ceilings to damage the structure. A rapid professional response to your property is essential in decreasing the chances of loss. 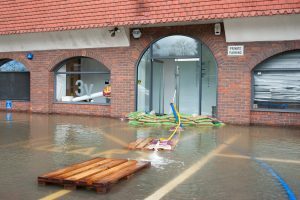 Here are some common misconceptions and errors that homeowners make when dealing with property water damage. Actually, your first call should be to an industry expert to address the immediate danger. The steps you take in the first hours have a huge effect on the severity of damage and effectiveness of clean up. Get a team of experts on site to help you assess the damage. It is better to gather your thoughts and valuable information before calling your insurance company. A homeowners policy specifically EXCLUDES floods; a flood is not covered under any normal insurance policy. And “flood” can be caused by an ocean, a river, or a lake. It could also be moisture cause by spring thaw or run-off from the parking lot up the hill; your agent will explain the limitations of a standard policy. To be covered, you must purchase a separate insurance policy that is specifically for floods such as one issued by The National Flood Insurance Program. Note that it takes 30 days to activate and must be paid in full. After the insurance adjuster visits and gives you a recommendation for a restoration team, you are not obliged to use them. You can choose a service company that fits your needs. To be clear, it is actually illegal for your insurance company to even insist that you must use the company they recommend. So ask friends, research online and choose a quality repair team like Regional Property Group in southern Maryland. When dealing with flood waters, the industry rates the ‘dirtiness’ of your water. Category 1 water is from a source of water that does not pose a substantial threat to humans. This “clean water” could be a broken water supply line, a sink overflow or an icemaker malfunctions. However, just because the water is clean, you still need to protect your home and family. Mold and mildew are always present in the air. When the spores find a source of moisture, they begin to reproduce. If you delay clean up, the moisture can seep into cracks and cause serious structural damage. Even clean water must be addressed. The experts refer to water that is grossly contaminated and contains pathogenic, toxigenic, or other harmful agents as “Category 3 Water”. It may carry silt, organic matter, pesticides, heavy metals, or toxic organic substances. The rule is– if sewage touches it, it’s got to go. And that definitely goes for carpet, a porous material that can harbor a lot of bacteria. Don’t attempt to clean it; hire professionals to pull up the carpet, disinfect the subfloor, and safely remove all residue so that contaminants remain. Regional Property Group is a full service, a veteran-owned general contractor providing 24/7 emergency support services for water and fire damage losses in Southern Maryland.